Wolf Shenkman. Source: Ottawa Jewish Archives. By the late 1920s, if you were to press an Ottawan to name a builder of apartments, there is a good chance they would name Wolf Shenkman. 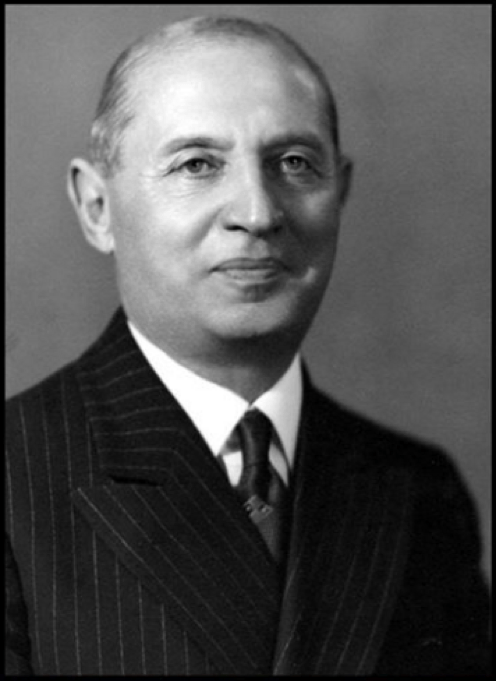 Shenkman arrived in Ottawa in 1904 and quickly began to buy and sell investment properties as well as construct homes. His first apartment building was completed in 1911.1Well, appears to be have been completed in 1911. The first instance of him being associated with apartment construction in the Contract Record is located in the April 5, 1911 edition. It is at the corner of Stewart and Cumberland in Sandy Hill, but have not verified this. See: “Residences,” Contract Record, Vol. 25, No. 14, p. 56. 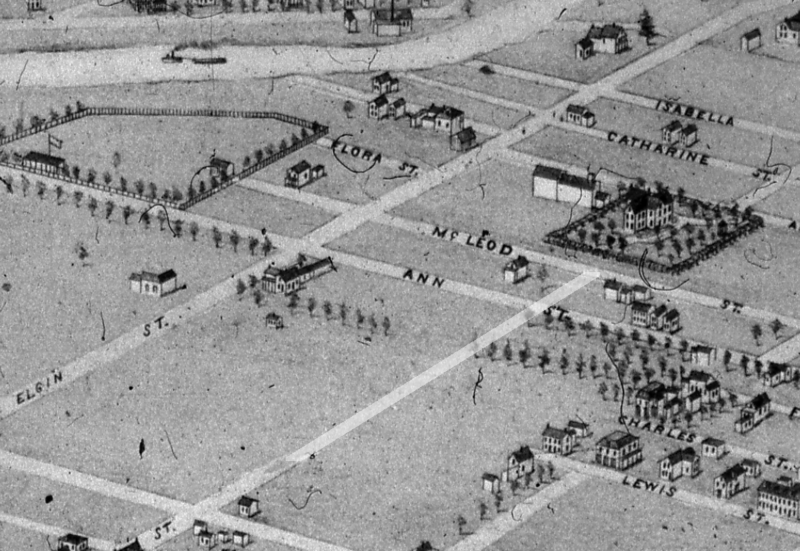 Detail of the area in 1876, as represented in Herman Brosius’ Bird’s Eye Map of Ottawa. I’ve gone ahead an “extended” Metcalfe street to its present length. The Chamberlin home is not depicted, but would soon be constructed. Source: LAC NMC 4236 H3/440/Ottawa/1876. On October 16, 1929, the Ottawa Journal reported that the property of Edson Chamberlin was purchased by Wolf Shenkman from his estate for $25,000.2”Chamberlin Home Sold for $25,000,” Ottawa Journal, October 16, 1929, p. 1. As was the case with so many such industrially-oriented Ottawans, Chamberlin was an American, in this case hailing from Vermont. 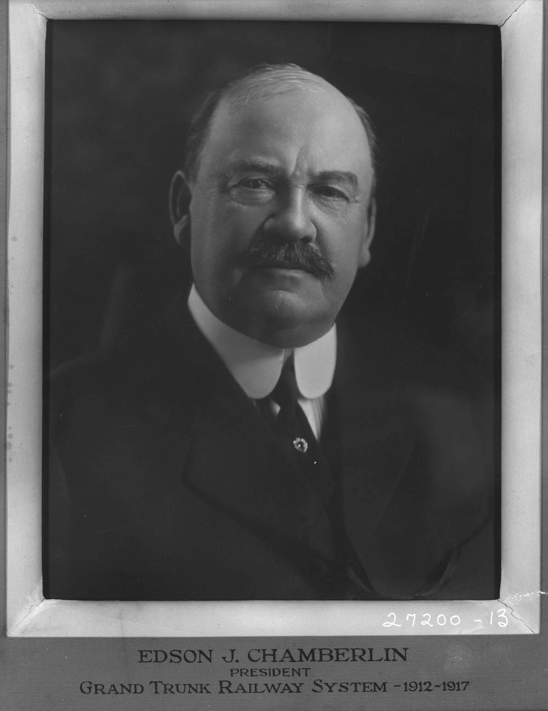 He was a long-serving manager at J.R. Booth’s Canada Atlantic Railway, the general manager of the Grand Trunk Pacific, and eventually became the president of the Grand Trunk Railway.3There is a whole lot to Chamberlin beyond those key positions of course. See: “Edson Joseph Chamberlin, of Ottawa, Former President of Grand Trunk, is Dead,” Ottawa Journal, August 27, 1924, p. 1. The man himself, Edson Joseph Chamberlin. Source: LAC R231-2265-2-E (CNR) Box INT 013 Item 27200-13 MIKAN 3350331. 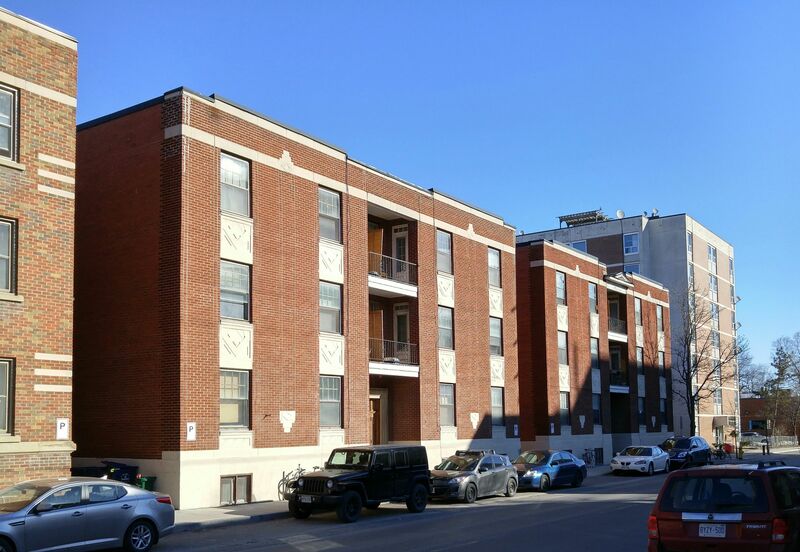 The property fronts on Metcalfe street, where it extends for 196 feet from Frank street to Gladstone avenue, and has a depth along these two streets of 248 feet. The house is perhaps the oldest one in the locality, having been put up more than 40 years ago. The house is two and a half stories in height, and spreads over a wide space, there being 15 rooms, some of them exceedingly large. Surrounding the house in a spacious stretch and lawns and gardens, which in the summer time has been a constant source of admiration for lovers of beautiful home settings. The property was sold by the Chamberlin estate in order to facilitate winding up proceedings. The purchaser plans to erect a large apartment house on the site.4”Chamberlin Home Sold for $25,000,” Ottawa Journal, October 16, 1929, p. 1. I haven’t located a picture of the home itself (which is interesting, considering how busy Topley was in the neighbourhood shooting homes), but I do have some context. The property, as depicted in the Insurance plan of the city of Ottawa, Canada, and adjoining suburbs and lumber districts, January 1888, revised January 1901. Source: LAC R6990-293-3-E NMC13793. The home to the left isn’t the Chamberlin property. It’s a block down, hidden among the trees. Source: Bytown Museum P1902, n.d.
Another photograph of Metcalfe. Source: LAC Topley Series SC [ca. 1911] PA-009864. Plan 204329, May 1931. The surveyor was none other than Norman B. MacRostie, who was at the centre of so many surveys, town plans, and developments. Source: Ottawa LRO Reel 4AR140. 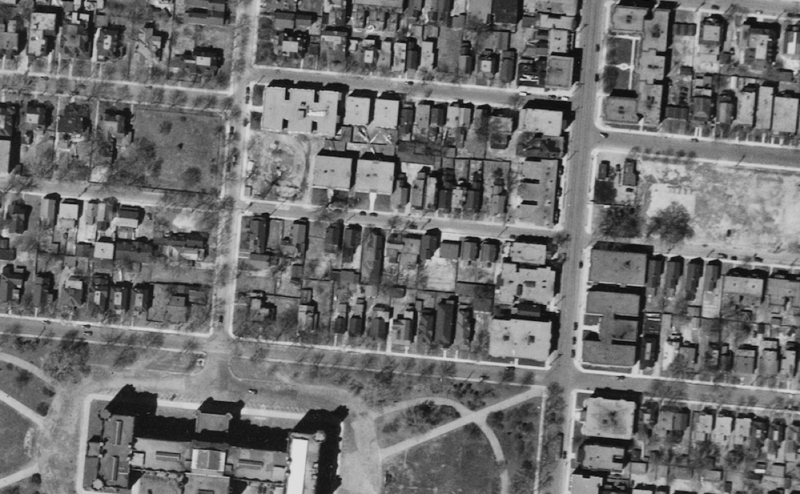 Thanks to the University of Ottawa’s recently-scanned aerial images from the National Air Photo Library, we can see the progression of the lot’s development. The lot in 1928, just before it was purchased by Shenkman. 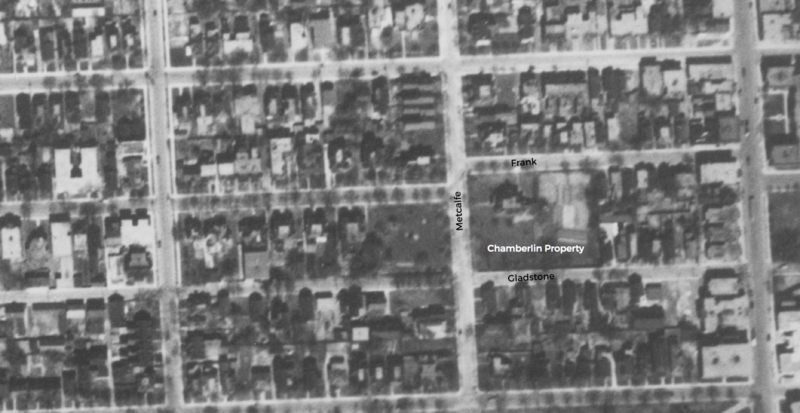 Chamberlin’s house is on the north west corner of the lot, at Metcalfe and Frank. Source: National Air Photo Library / uOttawa / A18-53 May 11, 1928. The lot in 1931 immediately following the subdivision of the lot. Here we see the Queen Victoria and Chamberlin Manor nearing completion. The Museum of Nature (Victoria Memorial) is at the left, for reference. Source: National Air Photo Library / uOttawa / A3332-71 May 26, 1931. The site in 1933. Her were see the Queen Victoria, the Lasalle, Chamberlin Manor, the Bessborough, and the Glademore. Construction has yet to begin on the Trafalgar. Source: National Air Photo Library / uOttawa / A4570-61 May 5, 1933. What we can see above is the progression of this rather significant project. On the rear two lots along Frank street, we can see the Queen Victoria Apartments and the Labelle (now Aitken). On the corner of Metcalfe and Frank is the Chamberlin Manor, which sits adjacent to the Trafalgar Apartments. 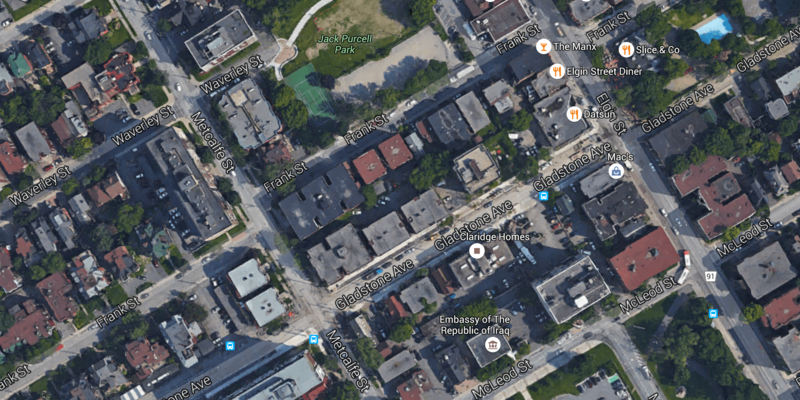 The rear two lots along Gladstone avenue are the Glademore and the Bessborough. The Queen Victoria and Labelle (Aitken) Apartments. Constructed 1931 and 1933, respectively. Image: March 2016. The Queen Victoria and the Labelle are small buildings. This pair, with 8 units apiece, we constructed by Wolf Shenkman, but it appears to be the case that he did so with the intention to sell them. He sold them on November 12, 1931 and the purchaser was none other than Meyer Evenchick, a local importer and manufacturer of costume jewelry.7Ottawa Land Registry Office, Abstracts, Plan 204329, Lots 3 & 4 South Frank Street, Reel 4AR140; “Larocque Store Sale is Largest November Deals,” Ottawa Journal, December 12, 1931, p. 14; “Ottawa Businessman in Japan Felt Country Headed for War,” Ottawa Journal, December 9, 1941, p. 4; Art Roberts, “Oyster Out of Business With New Process for Gems,” Ottawa Journal, June 7, 1947, p. 1947, p. 17. Evenchick only held on to his purchases for a short time, selling them to Oliver Pratt in 1937. 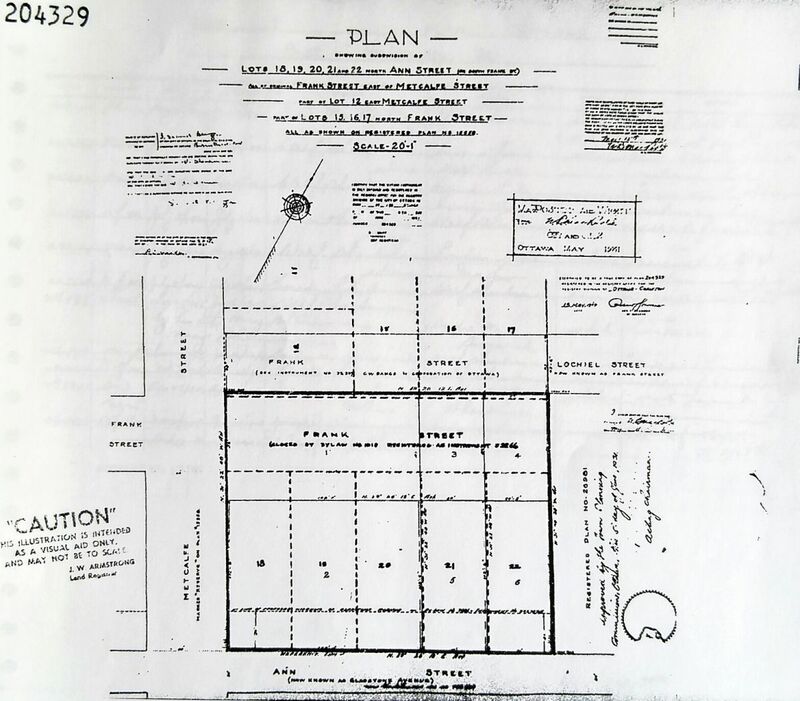 See Ottawa Land Registry Office, Abstracts, Plan 204329, Lots 3 & 4 South Frank Street, Reel 4AR140; “Property Deals in June,” Ottawa Journal, July 10, 1937, p. 3. I have yet to find an architectural citation. The Labelle was later renamed The Aitken. Image: March 2016. The Queen Victoria, stately as always. Image: March 2016. At about $20,000 apiece, these brick-clad wood-framed buildings weren’t aimed at the luxury market, but neither we they particularly affordable for those who needed it most. At $2,500 per unit,8At this point, I’m sticking with the simple measure per unit, just for illustrative purposes. I will later update with a more accurate number that takes into account the price of the land and mortgage payments, among other things. they represented a modest per-unit investment by the standards of the hot market just three years prior, but that still demanded rents of around $50 per month or so, which was well-above the working-class average of around $10-$15 per month. 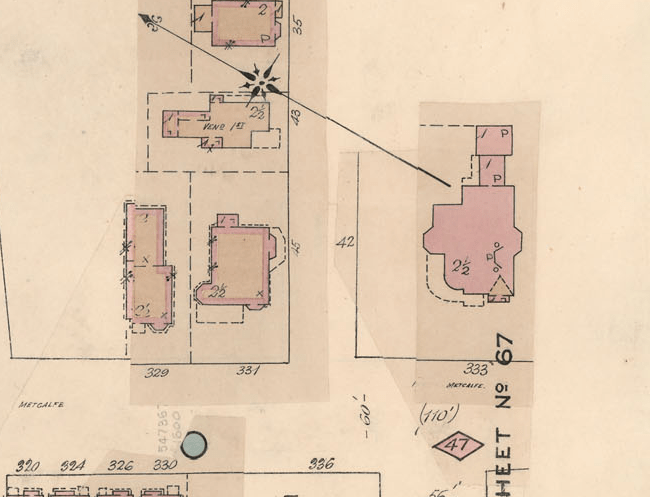 9Ottawa Land Registry Office, Abstracts, Plan 204329, Lots 3 & 4 South Frank Street, Reel 4AR140; Ottawa Journal; Cassie Doyle, Municipal Initiatives in Affordable Housing, 1900-1970, City of Ottawa. Ottawa: City of Ottawa Non-Profit Housing Corporation, 1982; H. Reginald Hardy. “Will Federal Housing Act Relieve Low Wage Earner?” Ottawa Citizen, July 20, 1935, pp. 1,5; H. Reginald Hardy. “Terrible Housing Squalour Revealed in Ottawa,” Ottawa Citizen, July 27, 1935, pp. 1,20. Indeed, the City of Ottawa tax assessment rolls for those years show the expected mix of tenants: young women working as clerks or secretaries, young couples without children, and retired couples. 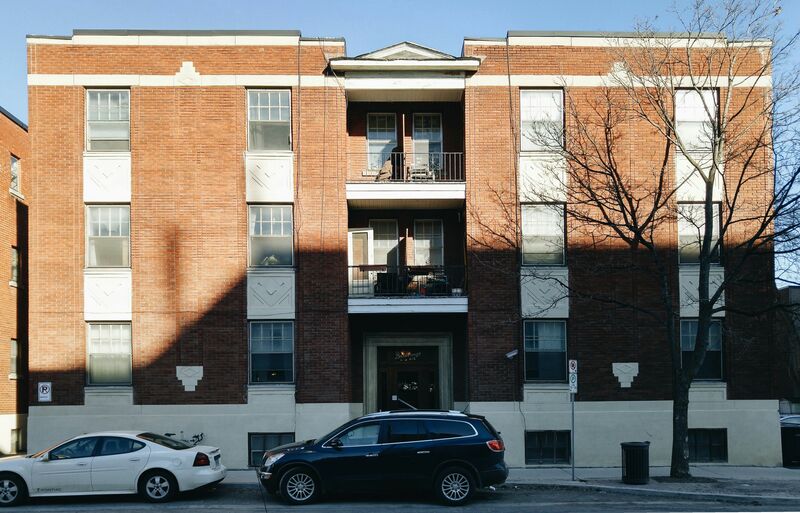 In the case of the Queen Victoria, Maud Thoburn’s mother Jean lived in Apartment 6 in the mid-1930s.10City of Ottawa, Tax Assessment Roll, Central Ward, 1933, Volume 2. Chamberlin (Chamberlain) Manor. Image: March 2016. The real showstopper was the Chamberlin Manor, a concrete block, brick-clad 24-unit apartment building facing Metcalfe and assuming the municipal address of the now-demolished Chamberlin home. Shenkman invested around $100,000 in the building and is the largest of the six. The description of Chamberlin Manor, as it appeared in the full-page advertisement. Source: Ottawa Journal, July 18, 1931, p. 12. Although Shenkman was not normally one to advertise as aggressively as other builders, the few times he did, a few interesting impulses were exposed. In the full-page ad that was run in the Journal it was written that Chamberlin Manor, “while modernistic in character is free of the ‘Futurism’ that has spoiled so many otherwise praiseworthy pieces of architecture in many cities.”11Ottawa Journal, July 18, 1931, p. 12. This could have been, of course, a sort of advertisement prose version that explains away the relatively modest choice of building materials (in comparison to those heady days before the Depression began). It could have also been a matter of having somewhat more conservative tastes in apartment design. It could have, of course, been a little of both. 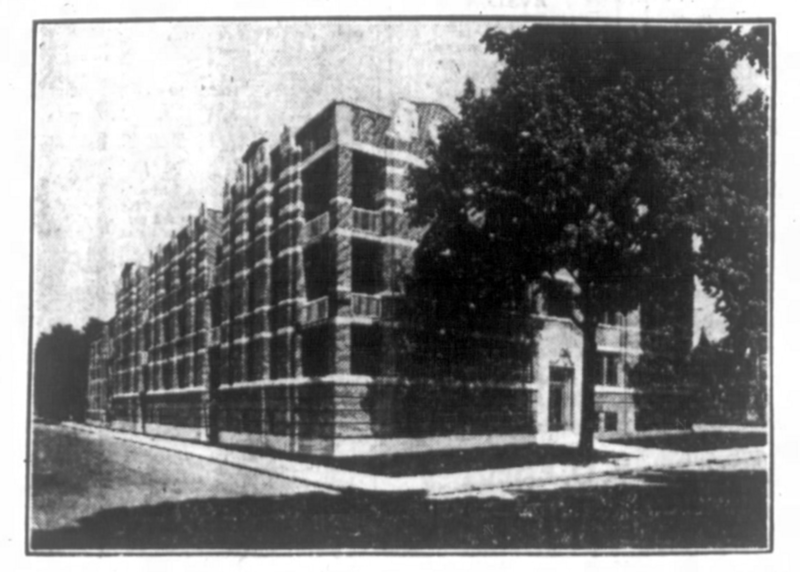 The photo that accompanied the advertisement for Chamberlin Manor. Source: Ottawa Journal, July 18, 1931, p. 12. None of this means that Shenkman went cheap, of course. 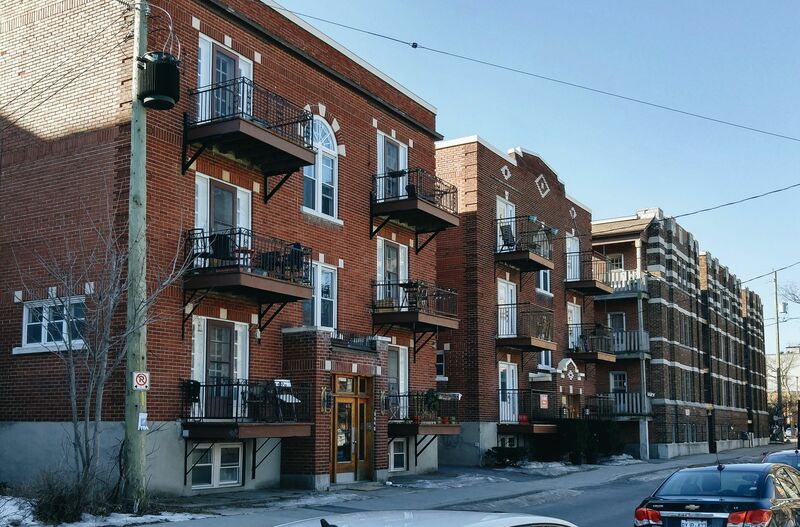 At $100,000, the 24-unit building represented a building investment of about $4,600 per unit. Moreover, it did have a number of value-added features, including balconies, which became a popular feature during this time. The larger units also featured French doors. Each unit was equipped with a Beach electric range and a Mayflower refrigerator. The larger units “for the family of a moderate size” do not appear to have been in much demand, and it seems to be the case that they were later subdivided.12Ottawa Journal, July 18, 1931, p. 12; Ottawa Citizen, July 11, 1931, p. 11; Ottawa Land Registry Office, Abstracts, Plan 204329 Lot 1 East Metcalfe, Reel 4AR140; Ottawa Tax Assessment Roll, 1933, 1935, 1939, Central Ward, Volume 2. The Glademore and the Bessborough apartments were completed in 1933. Image: March 2016. Next to be constructed were the Glademore and Bessborough Apartments, on the rear two (and a half) lots fronting on Gladstone Avenue.13The City had not yet widened the street, though it had expropriated the properties along the north side in its anticipation. This is why the apartments along Gladstone had not been constructed to the edge of the sidewalk/road. At about $40,000 apiece, the 15 unit Glademore and Bessborough were constructed on the same basis as their backyard neighbours, the Queen Victoria and Labelle. Also like the Queen Victoria and Labelle, they were not advertised widely.14Ottawa Land Registry Office, Abstracts, Plan 204329, Pt. Lot 2, Metcalfe East, Lots 5 & 6 Gladstone North, Reel 4AR140; Ottawa Journal, October 23, 1931, p. 21; Ottawa Journal, November 11, 1931, p. 12. This represents a building investment of about $2,667 per unit. The Glademore, at 221 Gladstone. Image: March 2016. Not quite twins, but close enough. The Glademore, 221 Gladstone. 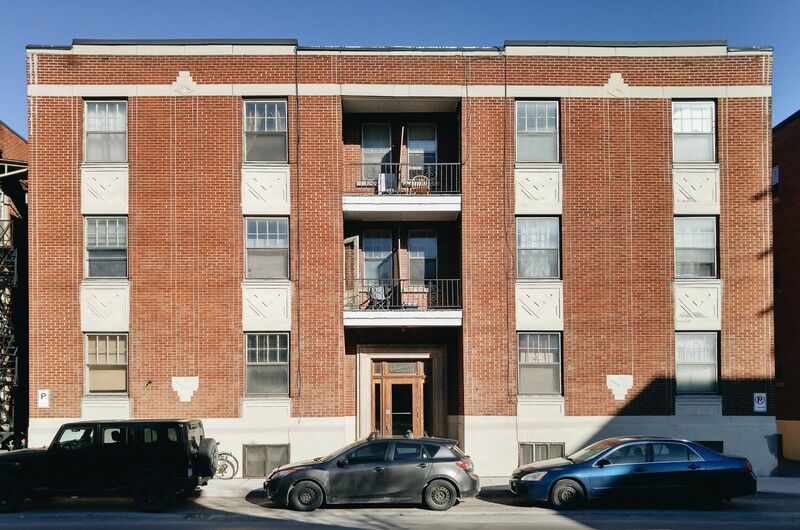 The Bessborough Apartments, 215 Gladstone. Image: March 2016. The Bessborough, 215 Gladstone. Once again, I don’t have an architectural citation for these. The Trafalgar, from the corner of Metcalfe and Gladstone. Image: March 2016. There was just one more piece of the puzzle to be put into place, and that was The Trafalgar at the corner of Metcalfe and Gladstone. It doesn’t appear to be the case that he intended it to be constructed last: the design was credited to Cecil Burgess in the December 31, 1930 issue of Contract Record. 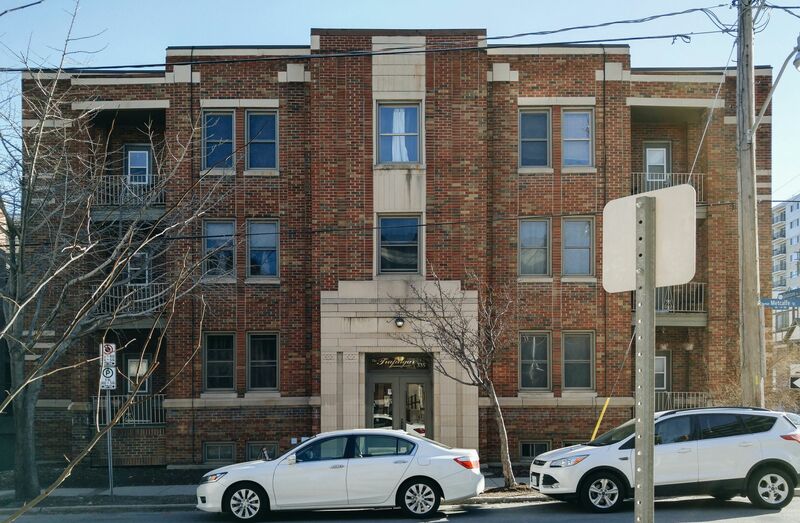 With such a large project, it may have been the case that Shenkman had some trouble accessing the required capital because the first mortgage on the property wasn’t secured until April 1933.15There was a second one in 1935. See Ottawa Land Registry Office, Abstracts, Plan 204329, Lot 2 East Metcalfe St., Reel 4AR140. Because of this timing and its similarity of style, and while I’ve not been able to locate a citation, it seems reasonable to me to assume that Burgess also designed Chamberlin Manor. This could very well be incorrect, but I can’t think of many reasons why Shenkman would hire two different architects at the same time to design two very similar buildings directly adjacent to one another. That, and Chamberlin is just so darn Burgessy to me. The final building in the Shenkman development is arguably the most popular of the six. Image: March 2016. 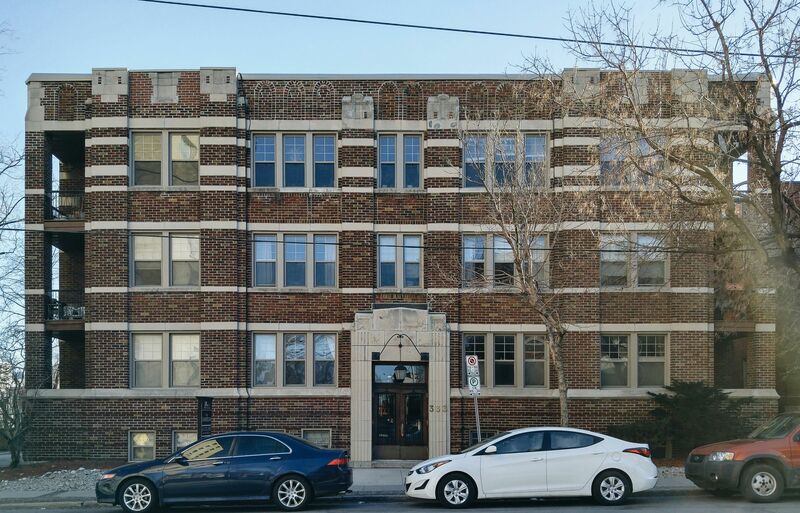 On May 1, 1933, the Journal reported that plans “had been drawn up for a handsome three-storey and basement apartment house building,” which was to be eighteen units, brick veneer, and “ornately embellished.” Shenkman was quoted as saying that the cost would be between $50,000 and $75,000.16$75,000 might have been the more accurate of the numbers in the end as the two mortgages on the property (1933 and 1935) were for that total. See “New Three-Storey Apartment Planned,” Ottawa Journal, May 1, 1933, p. 13; Ottawa Land Registry Office, Abstracts, Plan 204329, Lot 2 East Metcalfe St., Reel 4AR140. When completed, the Trafalgar had 21 units, but unlike Chamberlin Manor, it didn’t quickly experience a subdivision of larger units.17City of Ottawa Tax Assessment Roll, 1935, Central Ward, Volume 2. The $3,571 per unit Trafalgar was completed in 1934. Google’s aerial of the lot today. Image: Google Maps, 2015. I’m not quite ready to say it definitively (because I haven’t really looked into it with the sort of depth it needs), but I’m beginning to believe the following represents the single largest cluster development of apartment buildings that had been undertaken in Ottawa up to that point. This is both in terms of individual buildings (6) and the number of units in total (91). 1. ↥ Well, appears to be have been completed in 1911. The first instance of him being associated with apartment construction in the Contract Record is located in the April 5, 1911 edition. It is at the corner of Stewart and Cumberland in Sandy Hill, but have not verified this. See: “Residences,” Contract Record, Vol. 25, No. 14, p. 56. 2. ↥ ”Chamberlin Home Sold for $25,000,” Ottawa Journal, October 16, 1929, p. 1. 3. ↥ There is a whole lot to Chamberlin beyond those key positions of course. See: “Edson Joseph Chamberlin, of Ottawa, Former President of Grand Trunk, is Dead,” Ottawa Journal, August 27, 1924, p. 1. 4. ↥ ”Chamberlin Home Sold for $25,000,” Ottawa Journal, October 16, 1929, p. 1. 5. ↥ ”Football Club Asks City to Bear Costs Changes to Stand,” Ottawa Journal, November 19, 1930, p. 4. 7. ↥ Ottawa Land Registry Office, Abstracts, Plan 204329, Lots 3 & 4 South Frank Street, Reel 4AR140; “Larocque Store Sale is Largest November Deals,” Ottawa Journal, December 12, 1931, p. 14; “Ottawa Businessman in Japan Felt Country Headed for War,” Ottawa Journal, December 9, 1941, p. 4; Art Roberts, “Oyster Out of Business With New Process for Gems,” Ottawa Journal, June 7, 1947, p. 1947, p. 17. Evenchick only held on to his purchases for a short time, selling them to Oliver Pratt in 1937. See Ottawa Land Registry Office, Abstracts, Plan 204329, Lots 3 & 4 South Frank Street, Reel 4AR140; “Property Deals in June,” Ottawa Journal, July 10, 1937, p. 3. 8. ↥ At this point, I’m sticking with the simple measure per unit, just for illustrative purposes. I will later update with a more accurate number that takes into account the price of the land and mortgage payments, among other things. 9. ↥ Ottawa Land Registry Office, Abstracts, Plan 204329, Lots 3 & 4 South Frank Street, Reel 4AR140; Ottawa Journal; Cassie Doyle, Municipal Initiatives in Affordable Housing, 1900-1970, City of Ottawa. Ottawa: City of Ottawa Non-Profit Housing Corporation, 1982; H. Reginald Hardy. “Will Federal Housing Act Relieve Low Wage Earner?” Ottawa Citizen, July 20, 1935, pp. 1,5; H. Reginald Hardy. “Terrible Housing Squalour Revealed in Ottawa,” Ottawa Citizen, July 27, 1935, pp. 1,20. 10. ↥ City of Ottawa, Tax Assessment Roll, Central Ward, 1933, Volume 2. 11. ↥ Ottawa Journal, July 18, 1931, p. 12. 12. ↥ Ottawa Journal, July 18, 1931, p. 12; Ottawa Citizen, July 11, 1931, p. 11; Ottawa Land Registry Office, Abstracts, Plan 204329 Lot 1 East Metcalfe, Reel 4AR140; Ottawa Tax Assessment Roll, 1933, 1935, 1939, Central Ward, Volume 2. 13. ↥ The City had not yet widened the street, though it had expropriated the properties along the north side in its anticipation. This is why the apartments along Gladstone had not been constructed to the edge of the sidewalk/road. 14. ↥ Ottawa Land Registry Office, Abstracts, Plan 204329, Pt. Lot 2, Metcalfe East, Lots 5 & 6 Gladstone North, Reel 4AR140; Ottawa Journal, October 23, 1931, p. 21; Ottawa Journal, November 11, 1931, p. 12. 15. ↥ There was a second one in 1935. See Ottawa Land Registry Office, Abstracts, Plan 204329, Lot 2 East Metcalfe St., Reel 4AR140. 16. ↥ $75,000 might have been the more accurate of the numbers in the end as the two mortgages on the property (1933 and 1935) were for that total. See “New Three-Storey Apartment Planned,” Ottawa Journal, May 1, 1933, p. 13; Ottawa Land Registry Office, Abstracts, Plan 204329, Lot 2 East Metcalfe St., Reel 4AR140. 17. ↥ City of Ottawa Tax Assessment Roll, 1935, Central Ward, Volume 2. Thank you for an interesting article. I lived in the yellow-brick highrise at 330 Metcalfe (the Governor Metcalfe, between Frank and Waverley) from 1992 through 1997. I always admired this cluster of apartment buildings across the street. Years before that (in the mid ’60s), I remember as a high school student visiting a friend’s older sister who lived in the building on the NE corner of Metcalfe and Gladstone. Her apartment must have been one that had been subdivided from a larger one, because she didn’t have a kitchen sink. She had to do dishes in the bathroom sink! Even so, I was envious of her having an apartment to herself. Thank-you for sharing your memories of them! I’m also glad to get a more interesting confirmation about the subdivided units than my own simple counting of units. I’ve lived in places like that before as well, though which while they had a kitchen sink, it was pretty plain that the room serving as a “kitchen” wasn’t originally so. I know I sure would have been envious in that case as well! While it’s not yet in the works, a short story about the Governor Metcalfe is also on my to-do list. I look forward to your article on the Governor Metcalfe. I’d heard that the building could have been 12 stories, but the developer chose 11, instead, with higher ceilings in the units. I was on the 10th floor on the SW corner and had a spectacular unobstructed view to the south and west. I miss it. I live at 221 Gladstone! I have lived in a few apartments in this building.Thank you very much for the history. I had always wondered about these buildings. I lived in both one and two bedroom units in the Trafalger for years. It is still one of my favorite homes. Every apartment was unique with original fittings like a drop down ironing board in the kitchen disguised as a cupboard, or lovely French doors. Thank you for all you write and for sharing it’s history. Oh nice! I’ve only ever been in a unit of the Chamberlin and it was great as well. Thanks for sharing!